Where do you park your Long-arm machine? Thread: Where do you park your Long-arm machine? Macybaby, this such a cool area! I love your "machine shed". I haven't seen so many machines in one shed before! Parked???? I had to laugh out loud. The head is parked behind the two recliners in the living room and the frame is in the garage. I did have a huge two bedroom apartment that was all set up. But the banker thought better of the space and suggested I rent that out for a while. My hip was talking to me while doing it, so the next step is to decide where to move it, or to sell it, or upgrade to a computer package or what. My garage is ready for a make-over. I don't trust the water in the basement. Mine is in the remodeled garage that we turned into the boy's playroom and when they all were moved out the space turned into my sewing room. It is well lit as we put in fixed door windows where the double garage doors were. It is a great space and was very easy to get the big machine moved into. Most of my quilting friends included the cost of backyard quilting sheds in the cost of their LA set up. All they do is quilting in there and have the sewing room in the house. It was cheaper then adding a room to the house or remodeling. Mine is in what used to be the formal living room, then exercise room, then paint studio where I taught painting and now it is the longarm room. I just bought a computerized A1 and I am so excited. Selling my old Tinn Lizzie. I love your old machines. And I have the same oval little featherweight table...and a number of old sewing machines. When I got my machine 5 years ago I seriously considered setting it up in my living room. But is is in a large room in my basement that is well light. If wishes were fishes, I will own a piece of property in a few years on which I will build both a new home and a separate studio. The studio will have a wall of windows (walk in closets for fabric storage out of the direct sun), my sewing machines will be set up at one end, the long arm in front of the windows. There will be peekaboo glimpses of the ocean. I would need more room for storage. Which is why I want to build the house and a separate studio. The company does custom design but also has a simple 600 s/f cottage that would make a wonderful studio and eventual rental. The same company has a much larger home plan that has a huge loft that would work for a studio too. But that house is 2500 s/f, much too large for my needs. Most likely though I will continue to live where I am. If would love to renovate the basement with a goal of one day putting in a basement suite to generate some income. If I do that I will make sure I add lots of storage that I can use for my fabric. I've considered moving all my sewing out to the Machine Shed - but it does not have a bathroom. 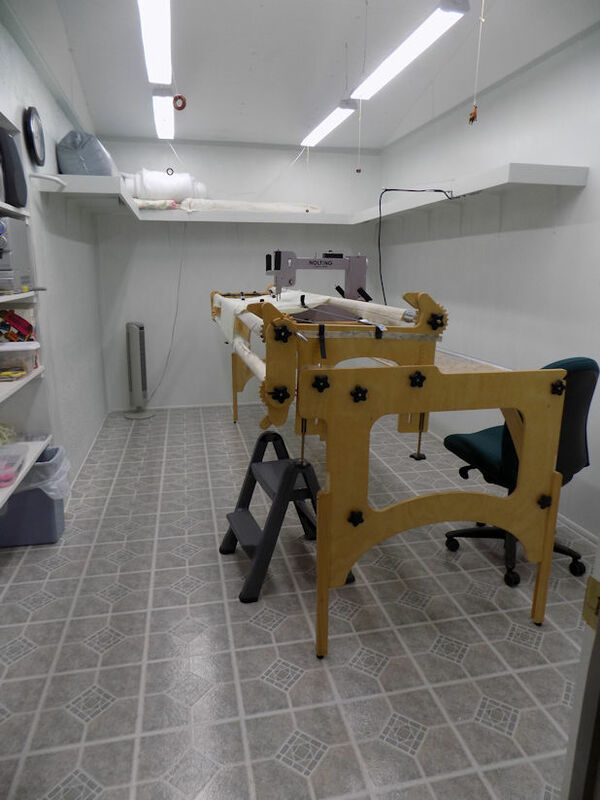 DH and I were just talking about downsizing when we retire, and I told him that a sewing studio that I can fit the LA and my working machines in is a must. I'll probably have to rehome most of my machine collection, but I've got several years before that is an issue. At one point I had my LA set up in what was the dining room. The biggest problem was that it's open to the kitchen and no way to close that off, so I could not keep the cats out. And they thought it made a really good hammock! I'm OK with having to share my sewing room with the cats, but did not like that. I love knowing that if I have a quilt on the LA - it's not going to get messed with by anyone but me. In my dreams.... I will have a she-shed one day though, and then all bets are off. This is a very interesting conversation. Mine is in the family room beside the pool table. Since the boys are grown up they don't use the pool table very often. The can't believe I have turned the family room into a long arm space since I already took one of their bedrooms for a sewing room. The bedroom with the attached bathroom. I put my long arm on wheels so when we are using the family room space, I can push the long arm over the the far side of the room so my long arm doesn't get interferred with, making plenty of room for everyone to use the pool table. Mine is in an unfinished basement. It's a nice walkout basement with windows and sliding doors. I had my husband paint the cinder block to brighten up the walls. I also hung up work lights from the ceiling joists. When we built the house we had planned to finish the basement, but with just the 2 of us we dont need the extra living space. I only make about 12 quilts per year so it works for me. Although i drool over the fancy upstairs rooms I see on this site. Our Great room has 22 foot tall ceiling and is full of windows. I fantasize about turning the basement into the living room and moving the longarm upstairs. Mine is in the basement. The only other place it could fit would have been the living room. Hubby refused to sacrifice the living room. Also, before you buy, take measurements on any parts that can't be broken down into smaller parts, like the table across the back. Make a cardboard mock up of it and see if you can get it into the space you want it without bending the cardboard. Those tables and rods don't bend around corners. And your ceiling height may not be enough to stand them on end to get them around a corner. 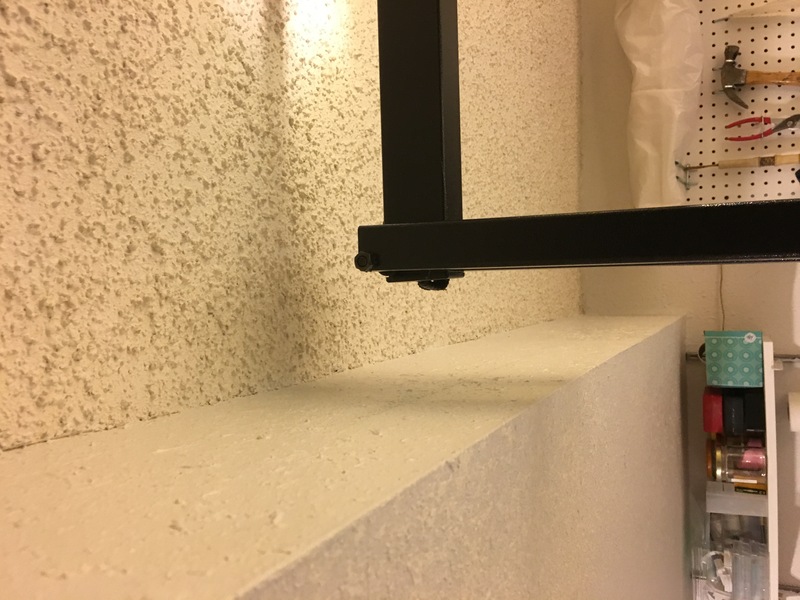 Even though I did all that, the seller forgot to tell me there were welded metal table bracket supports underneath the table, making the table a certain thickness. Because I didn't take the thickness into account, the real thing couldn't get into the basement the way the cardboard mock up did, and it laid out in the back yard overnight while we figured out a new way to get it inside (we had to remove a window in the basement)! We are renters here in Phoenix. Mine is in the combination living and dining area. Everything sewing related is in this room. Our second bedroom is a pretty good size and that is our den/TV room. DH can close the door and watch his TV shows. In our previous house it had to live in the living room. My sewing room was 8 x 8 and held everything else. This house is sooooooooooooo much better. I converted our basement family room into a sewing room - that's where mine is. My husband and I decided we were going to build on my Studio to our 3-truck garage. We built a 16' x 24' room. My parents blessed me with the money to buy my new APQS Lucey. Someday we'll be in a home big enough for my longarm and all things sewing-related. But, for now, we decided my life is going on right now, not "someday". I couldn't be happier with my amazing family, my Studio, or my longarm!! God is so good. We had to go outside the house! I have a longarm in a garage/shop building where we remodeled a room for it. Mine is in a room along the back side of the house. It used to be a back porch, that was professionally enclosed as part of the house a few years bforw we bought it. Windows all along the back with LED cam lights in the ceiling. Love it!! Ours is in the loft which is the whole third floor in my friend’s house. There’s lots of space nd lots of light. I have a sit down with two wing extensions. It doesn't need quite the room as some of your set-ups, so it lives in an upstairs bedroom, in front of a window I can look out of. I love my set up! Mine is in my youngest dd’s bedroom. She has the room over the garage. The front of the room is a 14x14 square with a closet and the end of the room stretching over the garage is perfect for Jarvis...aka my HQ Fusion. In the old house it was in half of our finished basement. But when we moved she lobbied for the biggest bedroom and a longarm roommate by promising to keep her room clean enough for us to make quilts. It’s working well.